Raanana, Israel, 18 December 2008 Enterprises and individuals alike are rushing to download alternative push mail solutions as Nokia drops its own-brand solution, Intellisync. With the Emoze Enterprise Edition, users can rest easy in the knowledge that they get a high quality push service at a low cost and the conversion from Intellisync will be seamless. Designed with business use in mind, the emoze Enterprise Edition provides superior, secure mobile push mail and sync of calendar and contacts to ANY mobile handset. “Push mail is undoubtedly the business “must-have”, as workers are increasingly on-the move and out of immediate reach to their PC,” said Eitan Linker, emoze CEO. 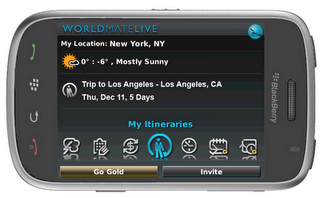 WorldMate, Inc., the leading provider of mobile travel services for frequent travelers, today announced two new enhancements to WorldMate Live hotel booking within the web application and WeatherCaster within its Windows Mobile application. WorldMate serves 1.8 million users across the globe and helps them manage itinerary details whether at home or on the go. ATLANTA, GA — December 8, 2008 WorldMate, Inc., a company specializing in mobile travel services with 1.7 million users worldwide, today announces that WorldMate Live, the Company’s flagship product, is now available for the BlackBerry Storm smartphone from Research In Motion (RIM) (Nasdaq: RIMM; TSX: RIM). emoze, the world’s first free, mobile, push email service, now allows Symbian users to add their Facebook messaging in combination with any number of email messaging systems, to their favourite mobile device. Java and Windows Mobile users will have the privilege within the next few days. There is no need to purchase a sophisticated Smartphone to tap into Facebook messages on-the-move. Users can simply add Facebook to their emoze portfolio on any handset. Instant access to read, reply and send messages, avoids the need to open the Facebook website. ‘Friends’ lists are immediately on their handset, without even needing to go through an internet browser.